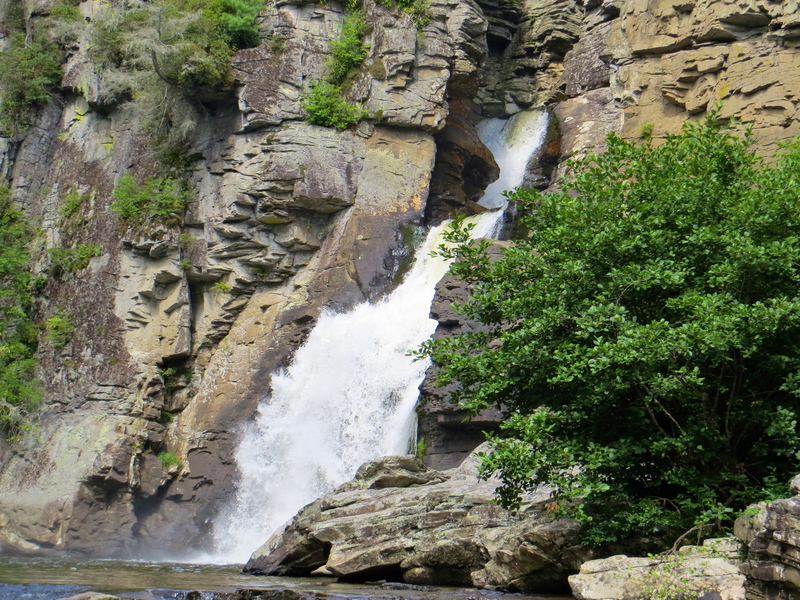 Linville Falls and Gorge is one of the Blue Ridge Parkway’s top attractions. 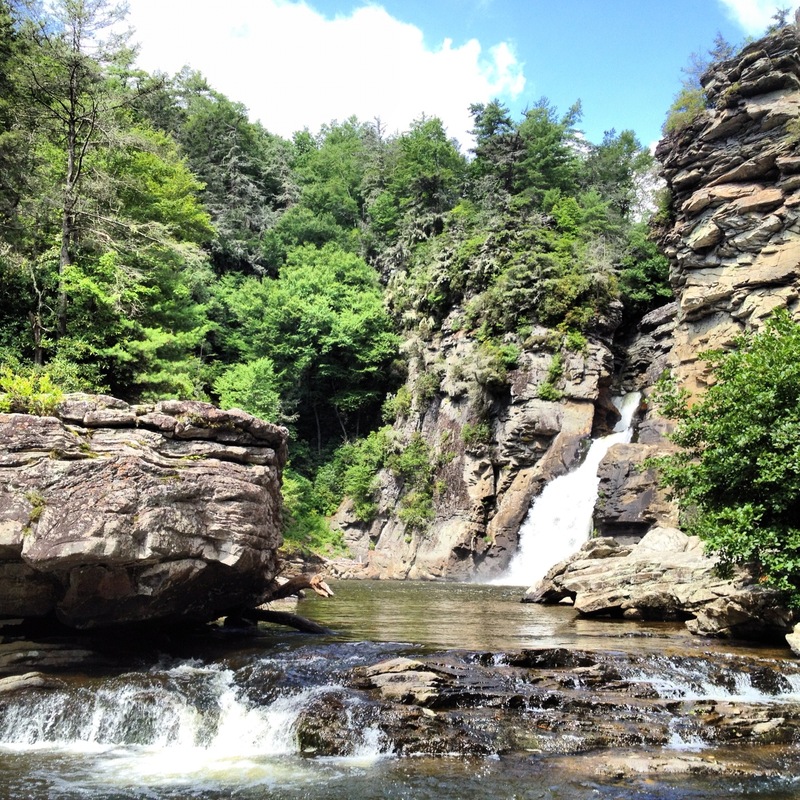 Linville Falls has the distinction of having the highest volume water flow of any NC waterfall, although it is certainly not the biggest or highest. With a nice gift center, restrooms, large parking lot, and numerous trails on both sides of the river leading to different and magnificent views, it is no wonder that this place attracts tens of thousands each year. Here I am on a Saturday morning, one of the busiest days up here, preparing a hike. What was I thinking? I had just stayed the night at the nearby Linville Lodge after attending the 1st annual Spruce Pine Barbecue and Bluegrass Festival the night before, so I was here and it was very convenient. The weather early on this morning was also perfect, so I could not resist. This day I chose to hike along the East side of the river or left side. This trail takes you to the Plunge Basin View and down to the bottom of Linville Gorge. 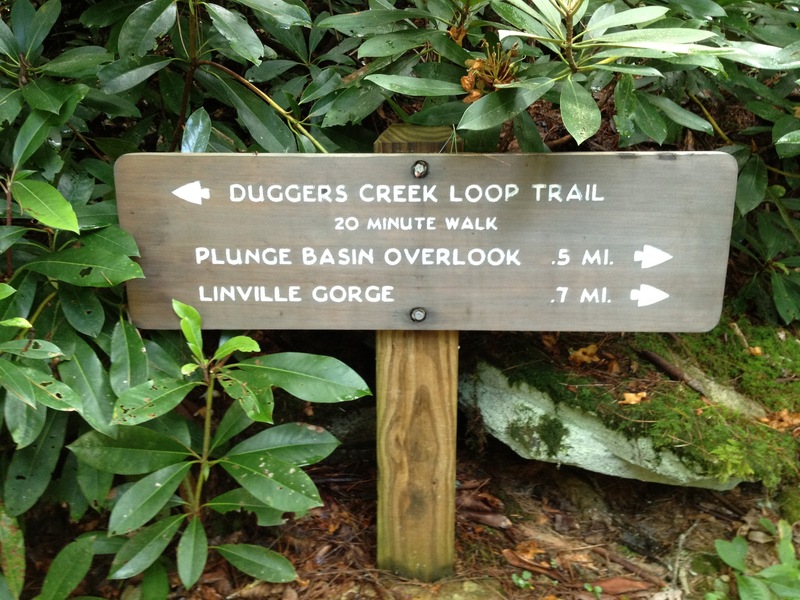 The mileage is 0.5 to the Plunge Basin View, and 0.7 to the Linville Gorge. Do not let these relatively small mileage amounts fool you. 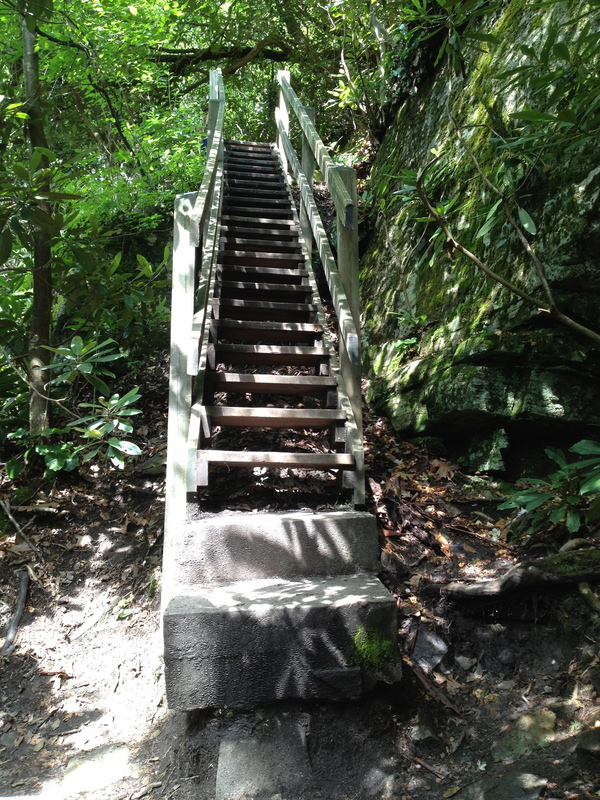 It is some steep, rugged climbing down to the bottom, and then you have to climb back out. The trail starts off relatively mild, taking you uphill. After 0.3 miles, you will reach a fork in the path where going straight takes you 0.2 to the Plunge Basin View, and going left takes you 0.4 miles to the the Linville Gorge. I begin by going straight here, you will want to see both views…trust me. Going straight, the path will level off and begin to drop, somewhat steeply, but nothing extreme. 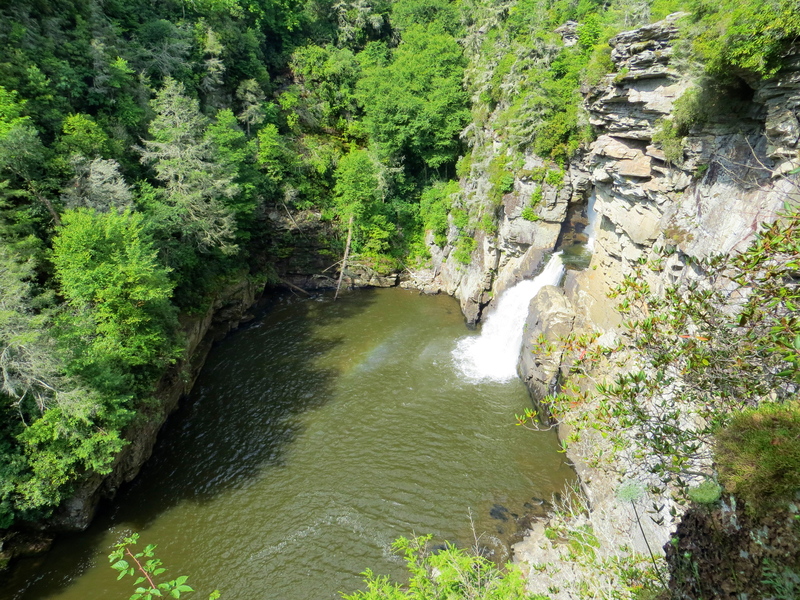 If stops at one of the finest views of Linville Falls, a side view known as the Plunge Basin View. You will be way above the falls here but a closer and more personal view of the falls and pool than the views on the west side of the river. 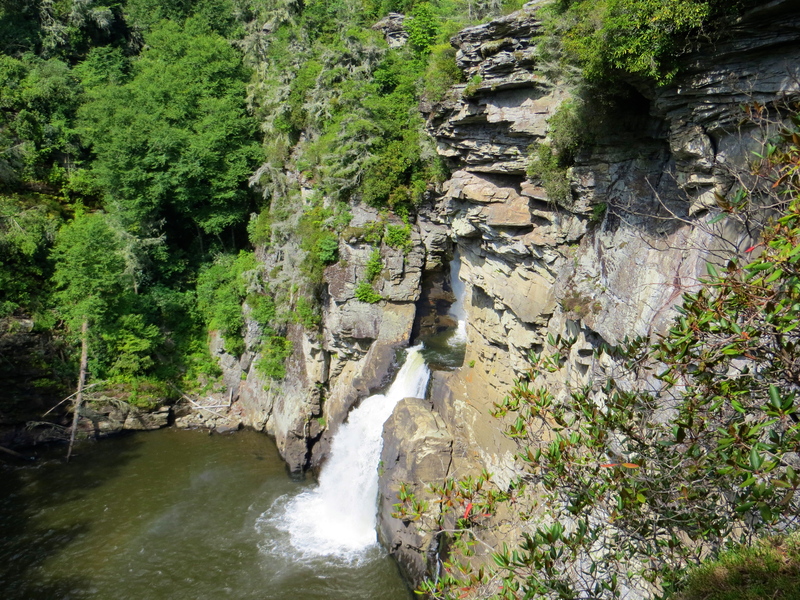 The trails on the west side do however give a great view of the Upper Falls just above Linville Falls and an interesting view at how the river has cut its way through the rock to pop out on the other side like it does. All trails on both sides are must-hikes. Here is the view of the entire falls and pool! After a few minutes you will find yourself at the river level and will need to rock hop upstream to get the best view possible. Once again, be careful down here. The views that will await you are phenomenal and will be well worth the short but strenuous hike. Next Next post: The Linville Rages! !